I can’t imagine why (!) 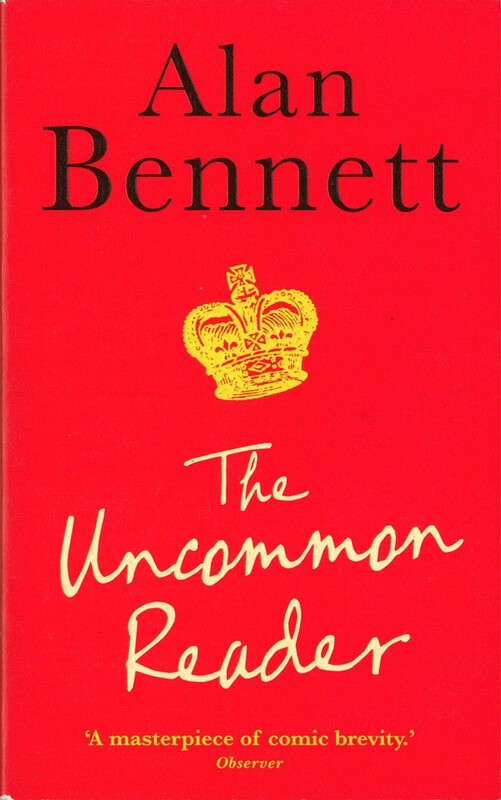 but it seemed like a good week to pluck Alan Bennett’s novella The Uncommon Reader off my shelf. I eyed it skeptically when I first acquired it, but I should have trusted the discerning reader who sent it my way: it turns out to be a gently whimsical little fable about the beneficially disruptive effects of reading. For those of you who don’t know the premise, the reader in question is HRH Queen Elizabeth II,* who, in pursuit of straying corgis, ends up at the City of Westminster “travelling library” (what we would call a “bookmobile” out this way) and borrows a book to get herself gracefully out of an awkward moment. “One” doesn’t usually have time to read (Her Majesty’s habit of referring to herself as “one” turns out to anticipate, deftly, her eventual realization that she lacks a distinct voice of her own) but once begun, she finds herself enjoying the unaccustomed experience and eventually can hardly be trusted to show up on time for state occasions, so much more interesting are her books than the canned speeches she is required to deliver. She begins handing out books, asking literary questions on walkabouts, and developing a new interest in the perspectives of those around her. So changed is she that she is suspected, not of emerging sensibility, but of encroaching senility…and things go on from there, but it’s such a tiny and delicious confection of a book that I won’t give out any further details here. It’s unapologetically middle-to-highbrow (Her Majesty learns to appreciate Henry James and disdains Harry Potter) and wholly in service to the nice liberal idea that reading (at least, reading the right books) is morally as well as intellectually beneficial, not to mention inherently democratic. But that’s OK: it’s just a reader’s fairy tale, a happily-ever-after for the bookworm set. That’s as nice a use of the charming anachromism that is the royal family as I could want. And at the same time, it’s oddly convincing: watching the Queen arrive at her grandson’s wedding, I half expected to see her tuck a novel into her handbag on her way into Westminster Abbey, or to see Howards End peeking out from behind the program. *The same discerning reader who sent me the book points out that the queen of the book is never explicitly identified as Queen Elizabeth, though it’s perfectly obvious (the profile on the cover of my edition is also perfectly recognizable from our currency). I’m so glad you posted such a darling review of what was one of, arguably, my favorite books of last year. I LOVE Alan Bennett (esp. The History Boys) and thought this little gem of a read was absolutely delightful. Thanks for a wonderful review! And, of course, it’s not the first time Bennett has featured Her Majesty in one of his works. She is also a character in his play ‘A Question of Attribution’ which is about the spy, Anthony Blunt who was Surveyor of the King’s (Queen’s) Pictures. Definitely worth seeing if you get the chance. It was televised so there may be a DVD version around. Of course, for those of us in education it is “The History Boys’ which is required watching.